General Dentistry means the clinical aspect of dentistry which renders basic Oral health care services to the general public which may extend from the basic to moderate treatment modalities depending on the institutional hierarchy in the Health department. Dental Clinic or dental OPD are the common synonyms for those clinics where general dentistry is performed. The services of those clinics are carried out through almost all medical institutions with wider coverage for the entire country. 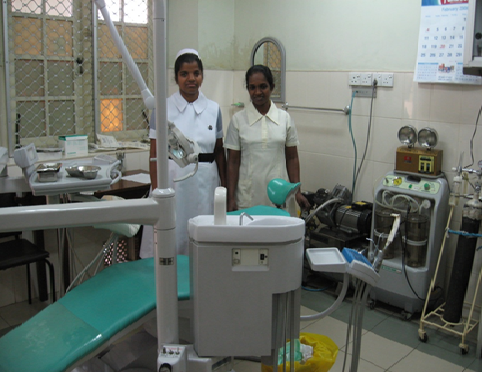 Dental clinics in tertiary care institutions and main hospitals at district level are provided with several Dental surgeons to cope up with the patients who seek treatment from those institutions. The clinic at primary care institutions gets a single dental surgeon bur relief arrangement would be provided to run those clinics smoothly in the absence of the permanent officer. Dental Surgeons with a basic qualification of BDS degree man all the dental clinics in the Health Department and approximately 1000 Dental Surgeons are employed to run the service smoothly. Since the Dental surgeons are absorbed in to the Health department as Grade 11 Dental Surgeons they may be promoted to grade 1 with stipulated criteria and postgraduate qualifications. Emergency treatment: severe tooth ache, dental abscesses, post operative bleeding swelling and other complications of dental origin and dental/Maxillofacial trauma which need emergency management. Dental extraction, simple restorations, scaling ect. Advanced restorations and minor oral surgical procedures may be done in those clinics where the facilities are available. Regular checkups and follow up: Patients who need extra care against dental diseases and those who have medical problems that may affect the dental/oral health are called upon for periodical checkups and follow ups. Screening for dental diseases and oral lesions: Early detection of dental caries, periodontal diseases and premalignant lesions will be done. Referral centre: The dental clinic being the focal point for advanced treatment modalities act as a main referral centre for appropriate specialized units such as OMF, Orthodontic and Restorative.